This 5 Quart Bowl-Lift Stand Mixer is perfect for heavy, dense mixtures. It also offers the capacity to make 10 dozen cookies in a single batch and 10 speeds to thoroughly mix, knead and whip ingredients quickly and easily. For even more versatility, use the power hub to turn your stand mixer into a culinary center with over 10 optional hub powered attachments, from food grinders to pasta makers and more. 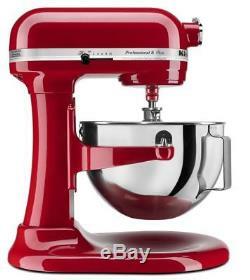 KitchenAid® Professional 5 Plus Series 5 Quart Bowl-Lift Stand Mixer Empire. For Everything You Want To Make. Turn your stand mixer into the culinary center of your kitchen. With over 10 different attachments, you can make everything from fresh pasta to burgers, veggie noodles, ice cream and more. 5-Quart Polished Stainless Steel Wide-Mouth Bowl with Handle. Provides sturdy bowl support for stability when mixing heavy ingredients or large batches. The lever smoothly raises the mixing bowl into position for efficient beater-to-bowl contact. Powerful enough for nearly any task or recipe, whether youre stirring wet and dry ingredients together, kneading bread dough or whipping cream. (1) Burnished Flat Beater, (1) Powerknead Spiral Dough Hook, (1) Wire Whip. Assembled with Pride in Greenville, Ohio. Multipurpose Attachment Hub with Hinged Hub Cover. Orders without a physical address will not be processed. This listing is currently undergoing maintenance, we apologise for any inconvenience caused. 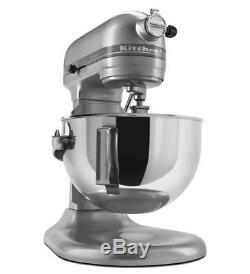 The item "NEW KitchenAid Professional 5 Plus Series 5 Quart Bowl-Lift Stand Mixer" is in sale since Wednesday, March 21, 2018. This item is in the category "Home & Garden\Kitchen, Dining & Bar\Small Kitchen Appliances\Mixers (Countertop)".